After 224 years, America’s first President will return to Cumberland! 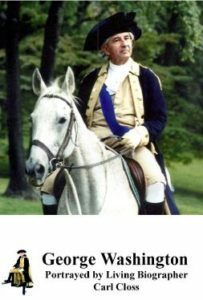 Allegany Museum has secured nationally known George Washington “living biographer” Carl Closs to visit the 2018 George Washington Whiskey Rebellion Festival, brought to you by the Community Trust Foundation. The Fest, a gala event held at the Allegany Museum, 3 Pershing Street, Cumberland opens Friday June 8, 6.00 to 10pm. We celebrate that Cumberland was the place where George Washington led troops at the beginning and at the close of his military career. When President Washington rode into Cumberland to suppress the Whiskey Rebellion, it was the only time a sitting President has lead troops into the field. In 1794, Washington rallied militias at Fort Cumberland, which led to the successful rout of the ‘scoundrels’ who rebelled against his government’s tax on liquor, known as the Whiskey Rebellion. Mr. Closs is a serious scholar and lively speaker who delights audiences with little-known, instructive and entertaining Washington facts. Ask him anything, and ‘George’ will be delighted to give you a well-researched and entertaining answer! Don’t miss this opportunity to get to know ‘George’, and have your photo taken with him. Also at the Fest, you can play live Colonial games, and sample small batch whiskies and other spirits, sample craft beers, and enjoy the open beer and wine bar. Of course, all of this will be accompanied by continuous servings of the delicious canapes that the Fest has become known for. Take home a bag of goodies, and get home safely with Sober Rides. Irresistible – and all money raised helps the Allegany Museum keep its doors open. Tickets are available through the booking button here, and on the Whiskey Rebellion Cumberland Facebook page and also from the Book Center, Centre St Cumberland, or Main Street Books in Frostburg. Tickets are $50 per person ($75 at the door). ← A gargoyle, 2,700-year-old ingredients, the Walking Dead, and Civil War history!